We all know how mundane weeknight dinners can get. Recycling 4 or 5 of the same old recipes each week is a crime most of us have committed at one time or another. Whether you’re too tired after a busy day to make something new, or you just don’t have the time to research new recipes, it can be hard to get adventurous with dinner on a weekday night. Faced with the dilemma on what to make for dinner earlier this week, I stumbled across a recipe I hadn’t made since cooking school. I remembered this dish being absolutely delicious, yet relatively simple. With most of the ingredients (despite a few exotic elements) in my fridge and pantry, this North African classic was on its way to the rescue. 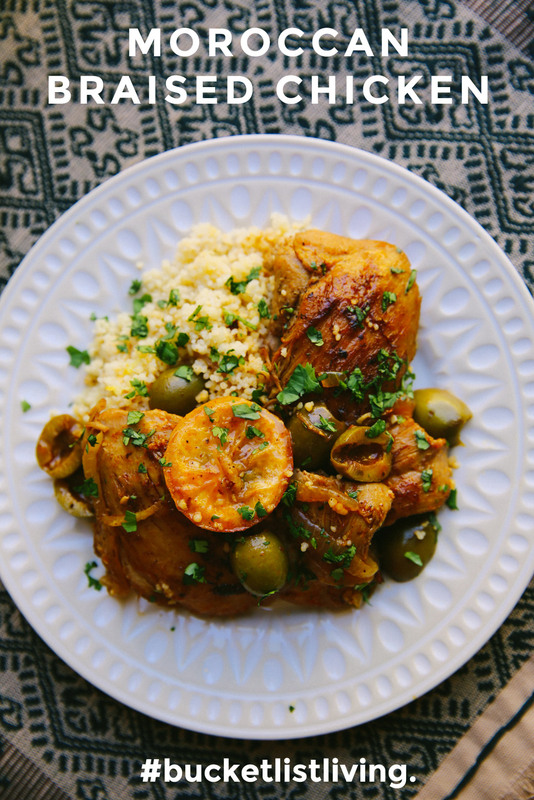 Traditionally made with unique and rare ingredients and cooked in a ceramic cooking vessel called a tagine, this week’s recipe has been adapted for convenient home cooking while still retaining its adventure factor. Don’t have a fancy tagine? Use a handy-dandy Dutch oven. Can’t find preserved lemons? Make your own or use a regular lemon. I love this recipe for its flavor and simple method. Using ingredients I usually have on hand such as onion, chicken, and stock combined with a couple special fixings like olives, lemons, and spices makes this the perfect getaway from your usual weeknight dinner. Baker’s notes: This recipe can be made so many ways. If you don’t mind the extra steps, browning the chicken before braising really adds a lot of depth to the dish. Also, if you love spices and feel really adventurous, a ¼ teaspoon of saffron is a great addition to this dish. In a large Dutch oven, heat 1 tablespoon of olive oil over medium high heat and sauté the onion, leek, and lemons for 7 minutes (you should see some browning on the bottom of the pan, careful not to burn). Add garlic, garam masala, sweet paprika, and ginger and cook for 1 minute just until fragrant. Generously salt and pepper chicken thighs and add to pot along with olives and stock. Throw in two bay leaves and bring mixture to a simmer. Cover with lid and reduce the heat to medium low for 10 minutes. Uncover pot and continue to simmer for 10-12 minutes. Meanwhile, in a large bowl, pour boiling chicken stock over couscous and cover with plastic wrap. Let sit for 5 minute or until couscous has fully absorbed the liquid. Fluff with a fork, Salt and pepper, and set aside. (You can add orange zest, lemon zest, parsley, etc. to the couscous. Once chicken thighs register 165-170 degrees on a meat thermometer, remove from pot. Add cilantro and lemon juice to braising liquid and check for seasonings. Pour over chicken thighs and serve with couscous. Optional: Once the chicken is removed from the pot, strain the liquid and add the drippings with the chicken (olives, onions, leeks) and sprinkle with chopped cilantro. Pour liquid back into the pot. Dissolve 2 tablespoons of cornstarch with 2 tablespoons of water and gradually add to the braising liquid stirring constantly. Bring mixture to a boil, stir until thick. Viola! Delicious lemon gravy. Post Written by Kayla V.